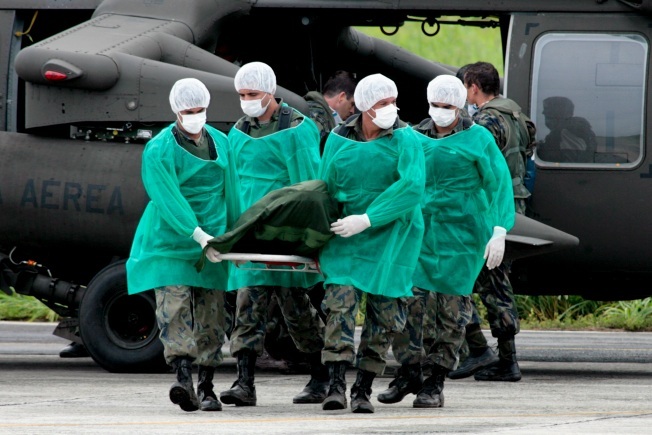 Members of the Brazilian Air Force carry bodies from Air France Flight 447. So far, 50 have been recovered. The search for bodies and debris from Air France Flight 447 took on renewed urgency as experts questioned how much longer efforts would prove fruitful, even as six more bodies were pulled from the Atlantic Ocean. Almost two weeks after the crash, Brazil's military said that June 25 has been set as a tentative date for halting efforts and that starting Monday officials will meet every two days to evaluate when to stop the search, depending on whether they are still recovering bodies or debris. Finding the plane's flight recorders — whose locator signals begin to fade after 30 days — is key to determining how and why the Airbus A330 went down en route to Paris from Rio de Janeiro. Debris and bodies from the jet also contain crucial clues, and warm water temperature affects the length of time a body floats and remains visible to searchers. According to the Brazilian military, the water temperature in the areas they are looking is averaging about 82 F — warm water that speeds up the process of a body surfacing, floating and then sinking once again, said William Waldock, who teaches air crash investigation at Embry-Riddle Aeronautical University in Prescott, Arizona. "At this point, it's not really surprising you are hearing them (the Brazilian military) talking about an end to the search," Waldock said. In water temperatures like those in the search area, he said, an intact body could likely float for two or three weeks — Air France Flight 447 went down May 31 with 228 on board. Those warm waters also mean there is a lot of marine life in the area and "they'll break a body down faster," Waldock said. Navy Vice Adm. Edison Lawrence said the Brazilians "have information" that a French ship had found six more bodies, which would bring the total to 50. It was not clear when the bodies were recovered; Lawrence said he thought it was either Thursday or Friday. It wasn't immediately possible to verify this with French officials. Medical authorities examining 16 bodies already brought on to land in Recife have refused to release information about the state of the corpses. Meanwhile, military ships and planes continued to struggle in worsening weather looking for more bodies and debris. The most important piece recovered to date is the virtually intact vertical stabilizer, which could give the French investigative agency BEA solid clues about what led to the crash. "The debris will be at the disposition of the BEA and they will decide what to do with it," Brazilian Air Force Gen. Ramon Cardoso said. He also said French ships equipped with sonar looking for underwater wreckage were approaching an area extending out about 70 kilometers (45 miles) from the last known position of the plane. The plane's flight data and cockpit voice recorders — perhaps the best hope of definitively learning what went wrong — remain elusive. A French nuclear submarine is scouring the search area in the hopes of hearing pings from the boxes' emergency beacons. The first of two U.S. locator listening devices won't arrive until Sunday. Weather in the mid-Atlantic was bad and getting worse. Rains reduced visibility for ships, and cloud cover blocked satellite imagery. If the recorders are not found, the cause could still be determined, though with much more effort. BEA spokeswoman Martine del Bono said she "absolutely can't respond now" to questions about reconstructing the aircraft from debris. She wouldn't comment Friday on whether this is because not enough debris had been collected to make the effort worthwhile.